Travel from Las Vegas to the Grand Canyon on one of the most popular experiences Pink Adventure Tours has to offer. Your Certified Interpretive Guide will pick you up at your hotel in one of our custom-made, luxurious Pink Adventure Tour Trekker vehicles. Then, it’s adventure time. Your tour sets off along historic Route 66 through the Mojave Desert, past the old Santa Fe Railway. Along the way, you’ll gain insider information about the wildlife, history, myths and legends of the Southwest. Approaching the Canyon, the landscape outside turns to the picturesque mountains and ponderosa pines of the Coconino Plateau. After arriving, you’ll stop at the historic Bright Angel Lodge—just feet from the rim. Part of the Grand Canyon Village National Historic Landmark District, the property boasts a gift shop, soda fountain, ice cream shop and history room that bring the property’s past to life. Next stop: unforgettable views. An easy walk from the Visitors Center, Mather Point showcases the vastness of the Grand Canyon. It’s the perfect place to take panoramic photos, with distant views of the North Rim visible across the 10-mile expanse. It’s more non-stop photo ops at Yavapai Observation Station. This unique viewpoint offers more stunning vistas and an indoor experience that covers the site’s geology and topography with a wall of windows for unobstructed views over the rim. As you explore, your guide will share unique insights about this natural wonder. You won’t want to leave without a souvenir to commemorate this amazing experience. The last stop takes you to a local trading post with art, jewelry and other keepsakes crafted by Native American artisans. To ensure that you can focus on your excursion, Pink Adventure Tours takes care of all the details. This includes a fresh breakfast, snack, full picnic lunch, complimentary bottled water and all park entrance fees. 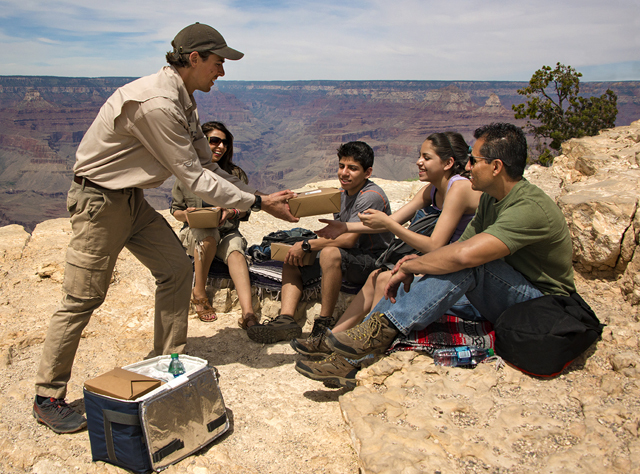 Child rates apply to children 3 to 12 years of age on all tours except Grand Canyon National Park South Rim, which is 3 to 15 years.